I would say most people who have read the Torah probably know that Eve was the first person to sin. “And it was not Adam who was deceived by Satan. The woman was deceived, and sin was the result.” 1 Timothy 2:14 Many people seem to use this as an argument against women, however I think while focusing on Eve’s sin many miss important lessons. “If we deliberately keep on sinning after we have received the knowledge of the truth, no sacrifice for sins is left,” Hebrews 10:26 Note, God told the serpent who deceived the woman “And I will cause hostility between you and the woman, and between your offspring and her offspring. He will strike your head, and you will strike his heel." Genesis 3:15 God did not speck of hostility between the first man and the serpent, even the male offspring who was prophesied to crush the serpent is to referred to as hers not his to show a spiritual lesson. There is no conflict between those who knowingly sin and Satan. Although woman was the first person to be deceived into sin by God’s grace she was also the first person God used to represent His true people. Throughout the Bible a woman is used to represent the people of God. “I have likened the daughter of Zion to a lovely and delicate woman.” Jeremiah 6:2 “’And I have put My words in your mouth; I have covered you with the shadow of My hand, that I may plant the heavens, lay the foundations of the earth, and say to Zion, ‘You are My people.’” Isaiah 51:16 “For your Maker is your husband, The Lord of hosts is His name; and your Redeemer is the Holy One of Israel; He is called the God of the whole earth.” Isaiah 54:5. Men are not excluded though, both men and women can be the bride of God, but we cannot consider ourselves God’s woman when we willfully sin. Yes believers may still make mistakes here and there but thought the power of God we must allow the Ruach Hako'desh to place the hostility between us and evil. We can see God’s wonderful redemption with Adam as well “In fact, the Tanakh says so: Adam, the first man, became a living human being; but the last ‘Adam’ has become a life-giving Spirit.” 1 Corinthians 15:45 “For if, because of the offence of one man, death ruled through that one man; how much more will those receiving the overflowing grace, that is, the gift of being considered righteous, rule in life through the one man Yeshua the Messiah!” Romans 5:17. The curse on Adam was not gender specific (we all work, die etc…but we don’t all give birth like woman) woman is included in man (Genesis 2:23) and Adam represents humanity as a whole. Just as we are all included in the curse on the man and we can all be included the blessing that can come from Messiah whose grace is sufficient to cover humanity as a whole. 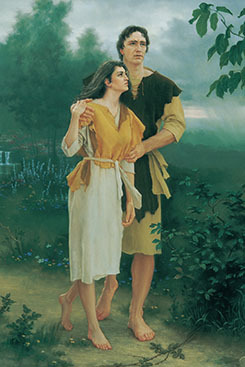 However to have the blessing from the second Adam our Messiah as for us we must become His bride, another Eve, who by the love of God gained hostility toward the serpent, “As for husbands, love your wives, just as the Messiah loved the Messianic Community, indeed, gave himself up on its behalf, in order to set it apart for God, making it clean through immersion in the mikveh, so to speak, in order to present the Messianic Community to himself as a bride to be proud of, without a spot, wrinkle or any such thing, but holy and without defect.” Ephesians 5:25-27. As we see the love of God we will no longer want to do the thing we used to. We will want to give up our defects as we see what God gave up for us.